Nokia 7700. Looks weird from the front. We’ve argued in the past that the modern smartphone era started with the launch of the original iPhone in 2007. But it could have happened much earlier than that. Back in 2003 – 15 years ago this month – Nokia launched something that could have been equally ground-breaking. The Nokia 7700 is today one of the rarest and most elusive Nokia phones you can try to find. In many ways it was a genius design which was far ahead of its time, in others it was deeply flawed and destined for failure. The era of the modern smartphone could have started here. It didn’t. 2003 was part of a golden era of mobile phone design. Colour displays and cameras were becoming accepted as the norm, but manufacturers were pushing ahead with smartphone concepts and tinkering with form factors to find new design paradigms. The 7700 was part of this drive. If you look at the technical specifications, the 7700 covers familiar ground. 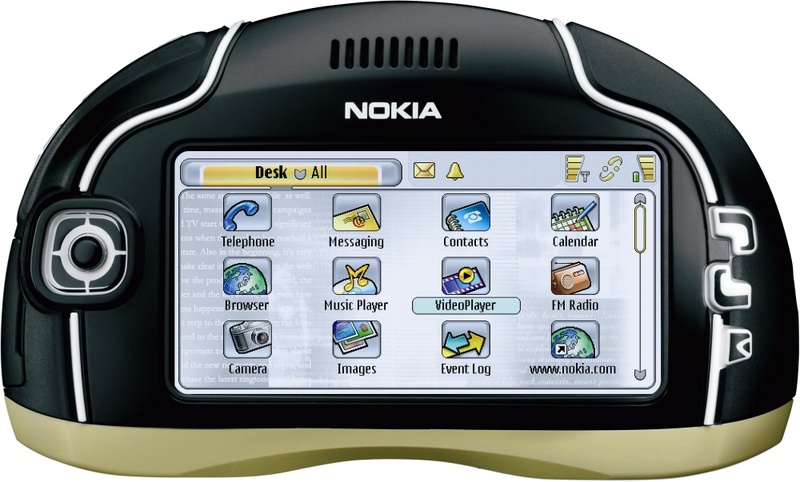 A 3.5” 640 x 320 pixel stylus-driven touch display was married with a new version of the Symbian OS called Series 90. A multimedia player, document viewer, email client and a full web browser are all the sorts of things you would see today, and there was an FM radio too. And it looks weird from the back as well. But then you look at the thing, and realise that the Nokia 7700 doesn’t really look like any other smartphone you have ever seen. Exquisitely designed in a sort-of-Taco shape, the 7700 was a slice of retro-futurism which completely ignored contemporary design conventions… or indeed common sense. Although Nokia certainly had a whole bunch of technology to throw at this, they didn’t really understand what a smartphone could be. Lacking either 3G or WiFi connectivity, the 7700 was limited to plain old GSM, Bluetooth and a cable for getting data on board. Nokia’s main idea for entertainment was the embedded FM radio which had added RDS so you could display data alongside the audio sequence, a concept they called “visual radio”. Hardly stirring stuff, and it didn’t really fulfil the potential of this sophisticated device. The lack of 3G was bizarre, in a time when 3G phones were just starting to become widely available. WiFi wouldn’t have been a stretch either, and the Nokia 7700’s rather bulky case could certainly have squeezed in some new features. 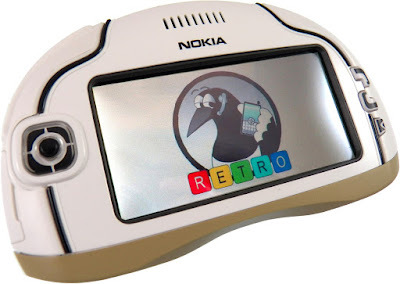 Nokia had already launched a couple of 3G devices including the equally “Dial W-for-Weird” Nokia 7600 and the WiFi-enabled Nokia 9500 wasn’t far behind, so Nokia certainly could have included those technologies if it had wanted to. It was also short of RAM and the processor was rather underpowered. The 7700 wasn’t really designed as a phone, more as something you would put on your desk. And if you DID want to do something mundane such as TALK on it, you’d find that the speaker and microphone were on the bottom and not the front or back. 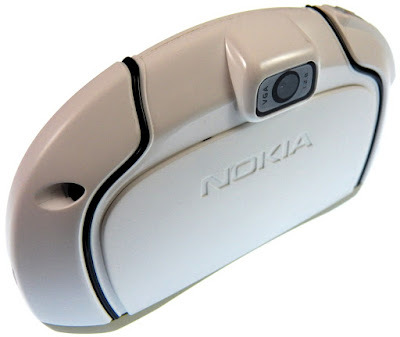 This idea had also been used on a few other Nokia’s and earned the nickname of Sidetalking. It's a smartphone Jim, but not as we know it. Nonetheless, the Nokia 7700 was one of the most exciting phone launches of the year and Nokia fans were eager to see what they could do. But then Nokia cancelled it. Perhaps wisely judging that the 7700 could end up as a costly disaster, they went away and redesigned it. Shrinking the case down, adding more memory, a faster processor and a better camera they came up with the Nokia 7710 a year later. Although the 7710 did reach the market, it still didn’t fix the underlying problems of being a bit too far ahead of its time while still lacking high-speed data. The relative failure of the 7710 led Nokia to a serious strategic mistake – it stopped trying to develop touchscreen smartphones altogether. When Apple did finally show the world how to make one, it took Nokia a very long time to come up with their first truly successful touchscreen device, the Nokia 5800 XpressMusic which was launched five years after the 7700. Although the launch of the 7700 was cancelled, a unknown number of prototypes and pre-production models were made. Some of these were sent out as technology samplers to partners and the media, some ended up the hands of Nokia engineers. Just occasionally one of these very rare handsets comes to market, with prices ranging between £500 to £5000 or more depending on conditions and packaging. In hindsight it’s clear that if Nokia had stuck with the formula in the 7700 and 7710 then they would probably have gotten it right. In the end a lack of perseverance squandered Nokia’s potential technological lead and in the end it was usurpers like Apple and Google that stole Nokia’s crown.